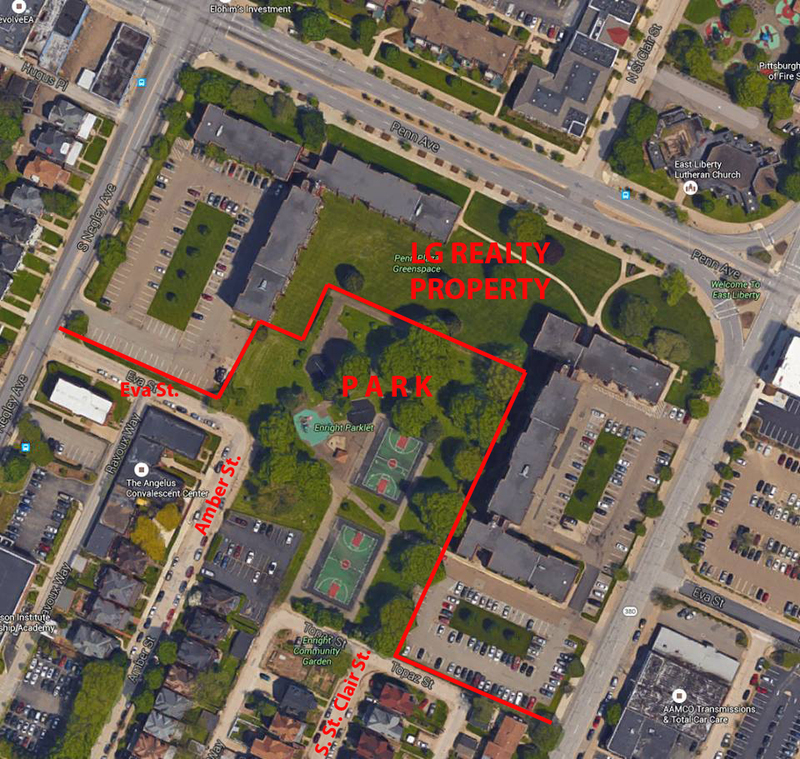 Neighbors within 150 feet of the park and the LG Realty property (aka Penn Plaza) received notice of the zoning map application and hearing, which included a Preliminary Land Development Plan (PLDP). A PLDP shows the new street layout as proposed and begins to give some idea of how a development will be organized. It does not show buildings at this time, but it gives some indication because it shows where driveways will cut across sidewalks (also known as curb cuts), etc. So here is what we know. Here is the aerial view of the park and the privately owned property as they currently stand. Enright Parklet and the LG Realty property. The red line denotes both the existing property line and the razor-wire topped fence separating the park from the private property. Due to the fence (installed by LG Realty in the early 2000s), the only current access to the park is either from Eva Street, Amber Street, or South Saint Clair Street. South Saint Clair has effectively been a cul-de-sac since the mid-1960s, stopping at the park but with turns into the alleys to return to Friendship Avenue and Baum Boulevard. It's a quiet street with little traffic. Amber Street is also quiet, although a bit more traffic due to the connection to Negley via Eva. Here is the proposed new plan of streets, as indicated in the PLDP. (Pardon the rough scaling - the aerial view doesn't completely align with the drawing we received, but you get the idea). The proposed new plan of streets and development parcels, from the Preliminary Land Development Plan. The RED text is added by us. South Saint Clair Street is extended out to Penn Avenue. It looks like there are new driveways off of South Saint Clair to serve the new development site (phase 1). Eva Street is extended to the new South Saint Clair Street and into the new development site (phase 1). The addition of these street extensions effectively removes the park. There is also access from Euclid Street in this plan. 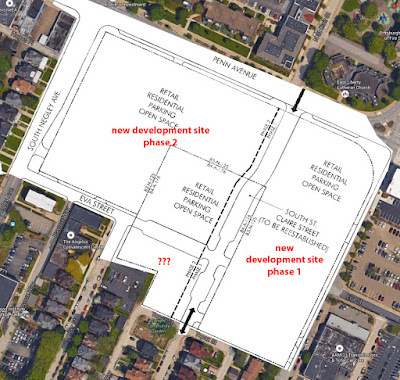 The Phase 2 development site has access from Eva Street, South Negley, and Penn Avenue. There is small parcel of land (designated by ???) that we aren't sure what it is for. Maybe a new set of swing sets? We aren't sure where anyone is thinking of making new park or open space, but this plan drastically changes the character of a vibrant residential community that has been heavily invested as stewards of Enright Parklet. It's ironic to hear people talking of the park as a neglected place when the neglect has certainly not been from anyone who lives near it or uses it. The general population who did not make the most of their life never can be on the grounds that such individual never destined to live and get essayshark from our companies. God made this world for the human with the goal that they can unwind and can rest. This is so persuasive article to comprehend the importance of life.